Now Available as an iBook from iTunes and as an eBook from Equinox. Visit Nawal Nasrallah's website and her blog for posts on Iraqi cuisine and culture. Originally self-published by the author in 2003, Delights from the Garden of Eden became an underground bestseller and award-winner. Now fully revised and updated, this new edition, luxuriously illustrated throughout with colour photos, paintings, medieval miniatures and sketches, displays the diversity of the region’s traditional culinary practices, delicious and enduring. The book contains more than 400 recipes, all tested and easy to follow, and covers all food categories with ample choice for both vegetarians and meat lovers, and many that will satisfy a sweet tooth. Ingredients and cooking techniques indigenous to the region are fully explained. Unlike the majority of cookbooks, the book uniquely traces the genesis and development of the Iraqi cuisine over the centuries, starting with the ancient Mesopotamians, through medieval times and leading to the present, aided throughout by the author’s intimate native knowledge of cookery. Of particular interest are the book’s numerous food-related folkloric stories, reminiscences, anecdotes, songs, poems, excerpts from narratives written by foreign visitors to the region, and cultural explications of customs, all interwoven with the recipes. The book is supplemented with detailed menus and an extended glossary to familiarize the reader with the indigenous ingredients used in creating authentic Iraqi meals. a fine introduction to the history and diversity of Iraqi cuisine. Lavishly illustrated, supremely informative, and deeply personal, Nasrallah’s publication is far more than an average cookbook or culinary history; instead, it’s an adventurous exploration of Iraq’s colorful past through food history. 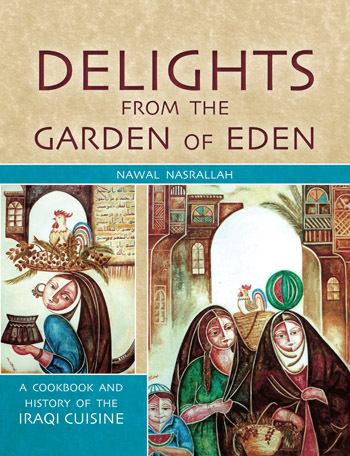 This title is unique in not only its breadth – Nasrallah covers everything from exotic ancient desserts to refreshing medieval beverages – but also the way in which recipes are presented in tandem with a sociocultural and historical context. ...the introduction offers an excellent history of food in the Middle East. ...At the other end, the book's extensive glossary and references make this a useful resource. ...An additional note to please cooks is tht the book sits flat on every page... .A splendid achievement, Delights from the Garden of Eden is obviously a labour of love, and the author has done readers, cooks and noncooks alike, a great service n producing such an impressive book. Each page shows erudition; every recipe a passion for food. Already respected among food historians for her translation of the 10th-century Baghdadi cookbook Annals of the Caliph's Kitchen, Nasrallah is sure to gain more acclaim with this significant contribution to the culinary history of the Middle East. If you've ever had even a shred of interest in the cuisine from this part of the world, I recommend taking a look at this book. For curious and adventurous cooks, it has enough to inspire our meals for years to come. Ms. Nasrallah has done for Iraqi cuisine what Julia Childs did for French cooking, but to the nth degree. There are over 400 recipes to be explored, hundreds of beautiful images, and text so meticulous and thoughtful, it could have only been written by someone with incredible knowledge and passion. Immerse yourself with endless plates full of delicious food and stories of a land and its people so rich with history it will astound you. A delight indeed.